After selecting the proper environment and plugins, there are a few tricks to increase search performance. These changes are recommended on most shared hosts and lower performance servers. These changes can improve the search performance significantly. While it's a great feature, it requires a decent server to handle. Shared hosts tend to have an execution limit, which can be reached very quickly with constant ajax requests. 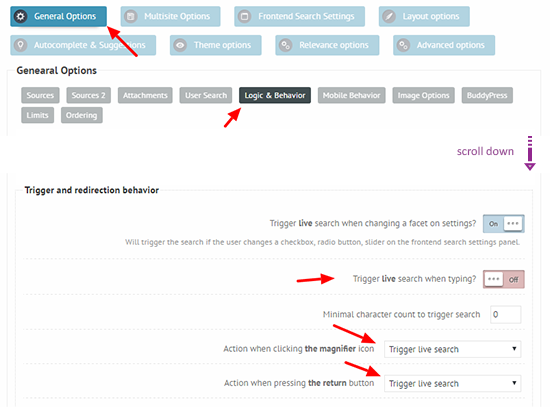 To disable this feature go to the General Options -> Behavior panel. Also, make sure that either the magnifier or the return button action is set to 'Trigger live search' (see screenshot), otherwise the live results will not appear. After this change the user will have to hit the Return key or click the magnifier icon to start the ajax search process (depending on your configuration). Autocomplete is triggered on every keystroke, so just like the previous option - unless only google is selected as the source. In that case your server is not invoked in the process. By default this feature is disabled, but in case you decided to use it, it can cause a decent performance slowdown. These changes can have a relateively big impact on the overall performance. As discussed in the previous section, the ajax performance is unfortunately affected by every single plugin you have installed. However there is an implemented custom ajax handler, which can try to bypass unneccessary plugin loading, making this process faster. To enable the custom ajax handler, click the Compatibility Settings submenu. This option is disabled by default. Searching in terms can slow down the plugin if the posts and the terms table grows big enough. If your main results are Posts, Pages, Products or other custom post types, you should definitely consider using the Index Table engine. These changes will most likely have a noticably small impact on the performance. Relevance is not a performance killer per se, but you can save up a few milliseconds by disabling it. Go to the Relevance Options panel -> Sort results by relevance and disable it.